The jointed goatgrass spikelet (joint) may contain one to four seeds and each spikelet can produce multiple seedlings. 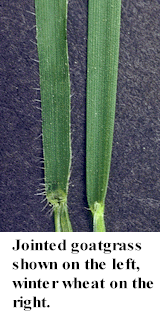 Hairs extend from the margin of the leaf blade of jointed goatgrass (left), particularly near the collar or stem, distinguishing it from winter wheat (right), which is hairless. 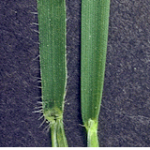 Jointed goatgrass spikes (left) are narrow and cylindrical in shape compared to winter wheat spikes (right), which are much broader. 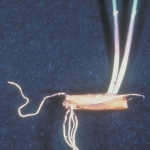 The National Jointed Goatgrass Research Program was initiated in 1994 by using a special USDA grant to fund regional research and extension activities directed toward limited the damage caused by jointed goatgrass to winter wheat production in the western United States. In 1993, it was estimated that nearly 5 million acres of farmland were infested with jointed goatgrass and that the weed was costing wheat producers ~$45 million/yr as a result of decreased wheat yield caused by direct competition with the weed and reduced quality and prices for the harvested wheat due to weed seed contamination. During the 15-year life of the Program, a total of $4.1 million of National Jointed Goatgrass Research Program funds were used to support jointed goatgrass research and technology transfer projects in 10 western states (WA, OR, ID, UT, WY, MT, CO, NE, KS, and OK) where jointed goatgrass is a problem. Long-term funding for the Jointed Goatgrass Program was requested by the wheat industry, which also contributed to the program through the actives participation of wheat producers and wheat industry personnel on the National steering Committee that directed the program. Initially, the Program focused on developing individual cultural practices that producers could adopt to help reduce the negative impacts of jointed goatgrass. During the middle and later years of the program, the focus was merging these into long-term management systems that integrated numerous cultural weed control practices and herbicide-resistant wheat technology. Technology transfer activities were an integral part of this program from the beginning, when seven producer-oriented workshops were held in the main winter wheat producing areas where jointed goatgrass biology, genetics, control tactics and herbicide resistant management. At the end of the program, four regional bulletins were published that provided wheat producers with region-specific strategies for the integrated management of jointed goat-grass in winter wheat production systems. These can be obtained through and open access website, www.jointedgoatgrass.wp2.cahnrs.wsu.edu, which was established in 1996 to provide the latest research findings to the agricultural community. Because of the success of this national program, there has been widespread adoption of the research findings, allowing producers to implement an integrated, science-based approach to managing jointed goatgrass. To read the full text of the final report, click here. Jointed goatgrass (Aegilops cylindrica L.) is a winter annual grass native to Asia and Europe. The weed was thought to be introduced into the U.S. as a contaminant in winter wheat seed. There have been multiple times and sites of introduction of JGG into North America. Some speculate that it was transported into Kansas around the late 19th century in contaminated ‘Turkey’ wheat seed brought from Russia by Mennonite settlers. Others reported it was brought into the Kansas in wheat made by the USDA, private seed firms, or individuals during the early 1900s. The earliest herbarium record of JGG was collected in Centerville, Delaware in 1870. Other records show that it was found in Kansas and Washington in 1917, Oregon in 1926, and in Oklahoma in 1946. 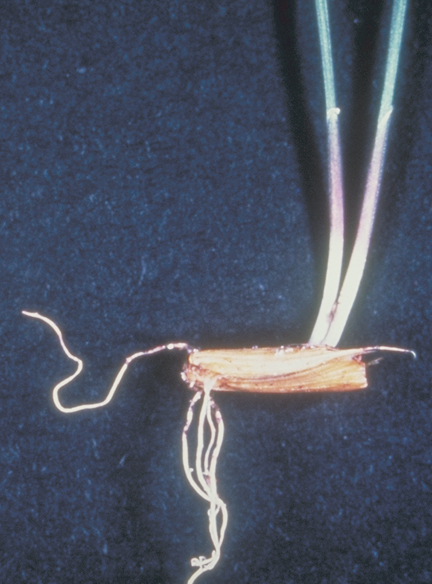 Jointed goatgrass became a troublesome weed in winter wheat during the 1970s, probably because of the introduction of less competitive, semi-dwarf wheat, the extensive use of nitrogen fertilizers, short crop rotations, and reduced tillage. Although jointed goatgrass is not native to North America it is now widely distributed in the United States In 1987 it was considered one of the ten most common weeds of cereals only in Colorado, New Mexico, and Oklahoma. Jointed goatgrass is reported to be an important weed of small grains in Colorado, Kansas, New Mexico, Oklahoma, Oregon, Utah, Washington, and Wyoming. Can Jointed Goatgrass Invade Pastures?